In the world of cakes, I am one who prefers simplicity. Maybe it's the fact that I grew up used to simple homemade vanilla cakes, those that my grandfather would throw together at midnight, just because the 4 grandchildren said they wanted cake. He was awesome like that. He never really measured, he never really used a recipe, he actually didn't cook much but we all knew him for his perfect cakes. There were no rich sweet gloopy frostings slathered on top, or complicated fillings. They were homemade, plain, not too sweet, with a dusting of powdered sugar, and enjoyed over a cup of tea. Those memories have stuck with me my whole life. I'm not a huge cake fan, I've always been more into savory than sweets, and I really dislike very rich cakes especially with tons of frosting. They make me feel quite sick, to be honest. But once in a while I'll get a hankering for a slice of fluffy cake and I have to cave. 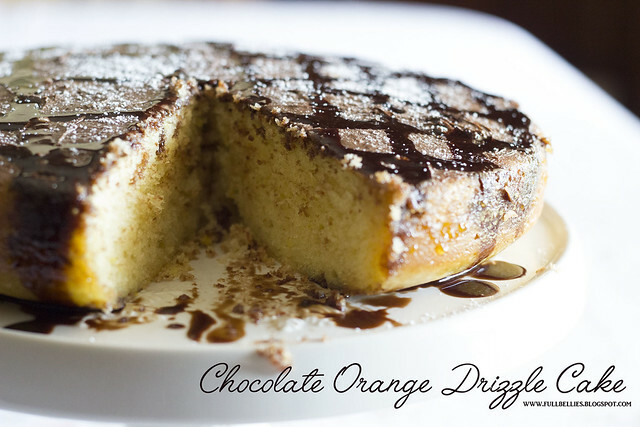 If you like chocolate oranges, you are in for a treat, because this cake tastes just like one of those. 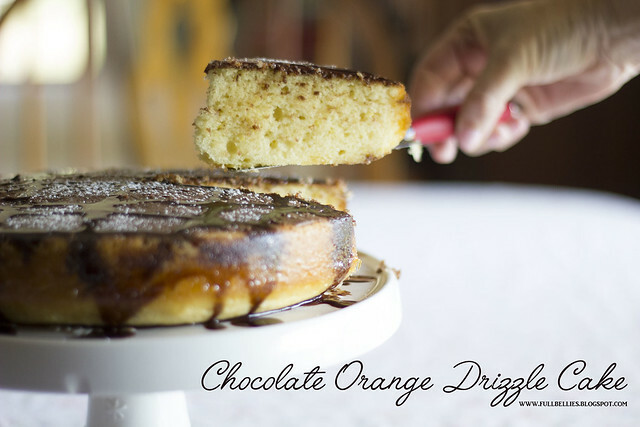 My son loves the chocolate oranges and he was quite excited when I handed him a slice of this cake after photographing for the blog. The recipe comes from one of my very much loved British cookbooks that I've had for many years. Preheat the oven to 350° F. Grease and line a 7 in. round pan. Cream together the butter and sugar until light and fluffy. Add the eggs, one at a time, and beat well. Add the grated orange rind, flour and milk and fold in with a metal spoon. Turn into the prepared pan, smooth the top and bake for 30-40 minutes until a skewer comes out clean. Remove from the oven and leave to cool in the pan. When cool, score the top of the cake lightly with a sharp knife. 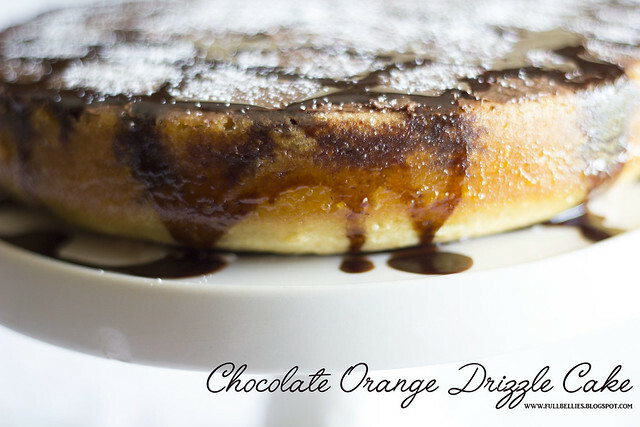 Put the orange juice and granulated sugar into a pan and heat gently until the sugar has dissolved. Bring to the boil and boil for 1-2 minutes. Pour over the cake. When all the juice has soaked in, carefully remove the cake from the pan. 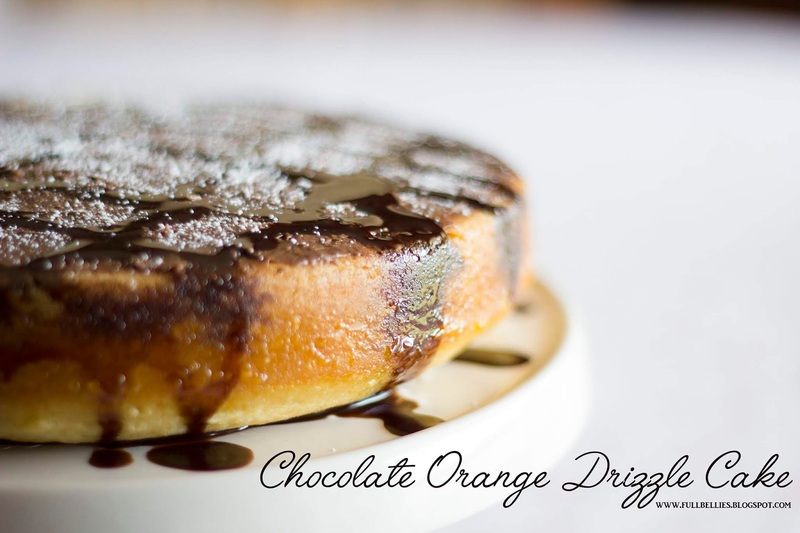 Melt the chocolate and drizzle over the top. You can leave it as is, or do a dusting of powdered sugar like I did. Crunchy, golden brown, delicious Okra. There really is much you can say about this yummy side dish, or appetizer, whatever you wish. Again, I had no clue what Okra was until I moved to the States, it's not a vegetable that is available in South Africa or Portugal, but boy is it one of my favorite things ever. Okra is a pretty sticky vegetable to work with which actually makes it quite easy to coat. 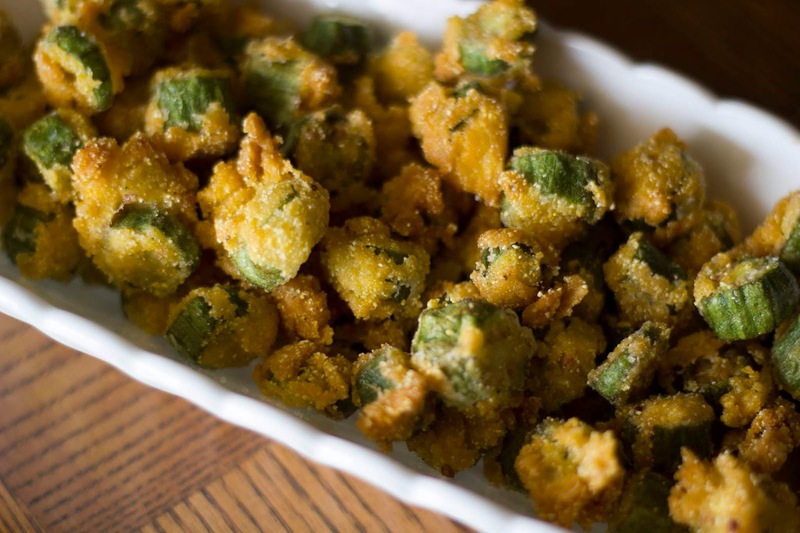 You will find a lot of variations and recipes for making the fried okra. Family recipes, favorite recipes all using either flour, or breadcrumbs or panko crumbs, some using just cornmeal, but I like to use a mixture of both flour and cornmeal. Drizzle some buttermilk over the okra, just enough to coat it well. Sprinkle on the flour and mix well to ensure that it's all coated. 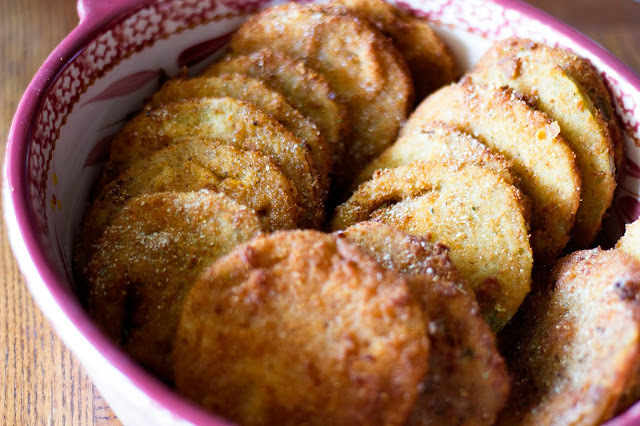 Sprinkle on the cornmeal and once again give it a good stir until all the okra is coated and doesn't stick together. Fry until golden brown, remove onto paper towels to absorb excess oil. Serve. I used to loathe tomatoes, like really loathe them. Growing up, the worst thing you could do was give me tomato in any way, shape or form, it would actually make me gag. I never quite understood why, but as I grew older I started liking them and now I absolutely love tomatoes. When I moved to the States 19 years ago, it was the first time I had ever heard of green tomatoes, and especially fried green tomatoes. Everyone raved about them, especially in the South but I wasn't quite sure that it was something I would enjoy, I mean I had started liking tomatoes but the thought of them fried wasn't exactly appealing to me. Fast forward to about a year ago when I finally tried them and fell in love, they're now one of my favorite appetizers to get when we eat out. 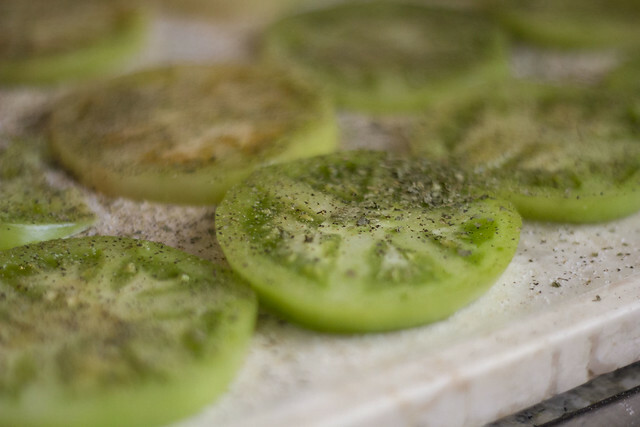 A few weeks ago, the hubby and I went to the Farmer's Market and I bought beautiful green tomatoes and knew exactly what I would be making with them. Slice tomatoes into ¼- 1/2 inch slices. Place tomatoes on several layers of paper towels. Mix together salt, sugar, black pepper and basil in a small bowl. Meanwhile, prepare your dipping station! In one bowl, add the flour. In another bowl mix together the buttermilk and egg. In the last bowl, mix together the bread crumbs and yellow cornmeal. Place the tomato slices into the breadcrumb mixture and press to coat both sides evenly. Let tomatoes sit for about 5 minutes to allow the coating to set. Place tomatoes into the skillet, without crowding the pan. Fry each side for about 4-5 minutes until golden brown. Place on a cooling rack with paper towels below to absorb the excess oil that drips off. Serve hot. When I was growing up, in Portugal, we used to go out on Saturday afternoons to a Pastelaria (bakery), and we would have an iced cold coke with lemon slices, and then a cake of some sort. It depended on what I felt like in the moment, but Pudim Molotof was by far one of my favorites. 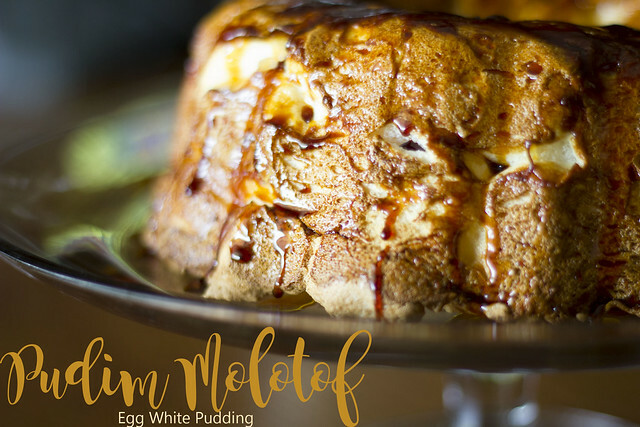 It's this amazing egg white pudding that just melts in your mouth with each spoonful, and is drizzled with caramel sauce or in some cases an egg sweet sauce almost like a curd, and toasted almonds. It is absolutely divine. I grew up loving it, I grew up wanting to learn how to make it, but was always very intimidated by the process. 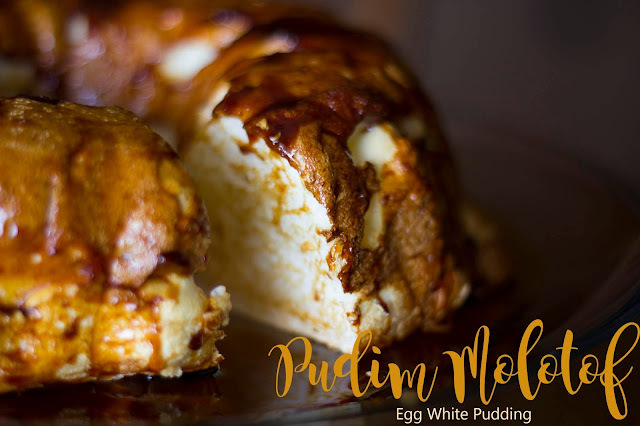 It's a bit of a finicky recipe and if you mess with it too much it will go terribly wrong, flop and you end up with a chewy meringue instead of fluffy melt in your mouth egg whites. About two weeks ago I was craving it and decided that it's now or never. I sweated and my hands shook but I was determined that I would conquer this dessert. And conquer it I did. So pleased and now that I've made it it is no longer intimidating and I plan on making it again for Christmas. Hint: Do NOT touch the oven when it's baking, do not open the door at all even if you're curious and tempted to take a peek. To make the caramel: In a saucepan add the water and the sugar, stir until well dissolved. Cook over high heat until caramelized and a beautiful dark brown. Do not overcook or it will burn the caramel and be extremely bitter. 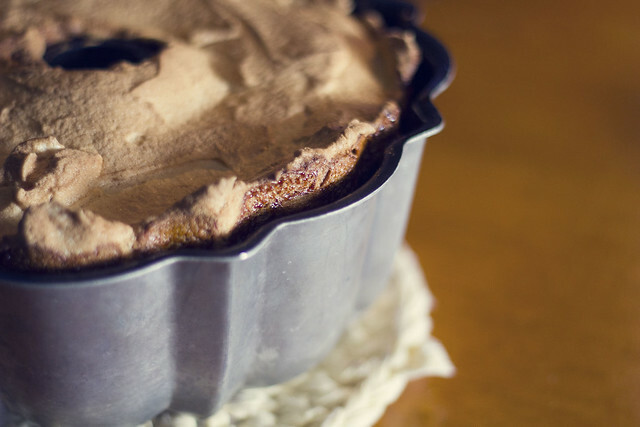 Once done, pour into a fluted cake pan and swirl all around to cover the bottom, sides and up the middle of the cake pan. Preheat the oven to 350° F. Place a baking tray in the oven with water, I usually fill with water about halfway up the baking pan. In a standing mixer, add the egg whites and whisk until stiff peaks form, slowly add in the sugar a little at a time, and finally the vanilla extract. 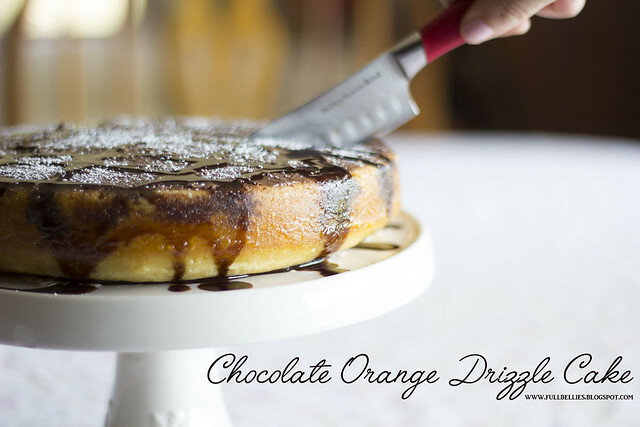 Scoop the egg whites into the caramelized cake pan, smooth the top, then smack the pan on the counter a few times to get rid of any air bubbles. Place the pan into the middle of the baking pan with the water, you're going to cook the pudding in a Bain Marie. Bake for about 20 minutes (do NOT open the door at all). Once the 20 minutes are up, turn the oven off and let it sit in the oven with the door closed for another 30 minutes. Again do not open the door at all, if you do the pudding will deflate. Once the time is up, remove from the oven, let it cool down a bit and then remove from pan. You have to do this really quickly and in one go or you'll end up with caramel sauce all over the place. Remove the cake pan slowly so the pudding will release without breaking. You can spoon some of the sauce over the pudding. Enjoy!!! 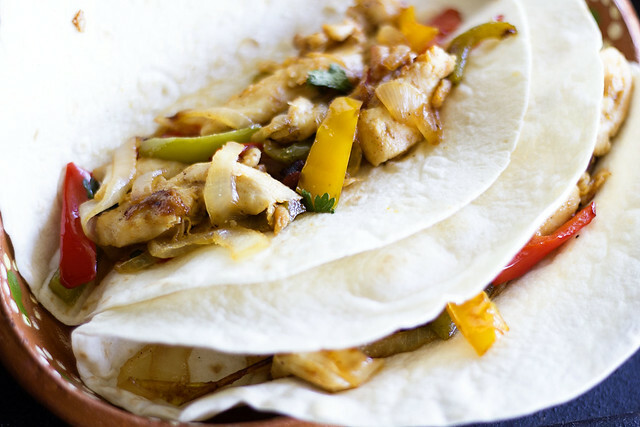 My family loves Mexican food, and my husband's favorite are Fajitas. 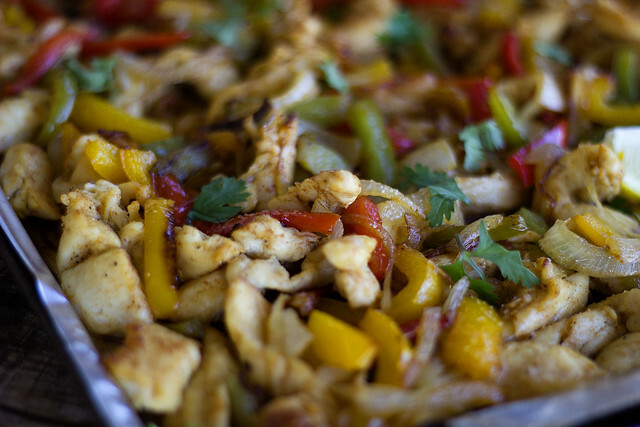 It's not something I make too often, but when I saw this recipe for sheet pan fajitas I thought "now that's brilliant". It saves time, the clean up is easier with everything in one pan and I can pop these in the oven while I get the rest of dinner finished off. Go ahead and give these a try, you won't be disappointed. Preheat oven to 400 degrees. Place a standard size rimmed baking sheet in the oven while it heats so that it's nice and hot. In large bowl toss 1 tablespoon oil with the bell peppers and onions. 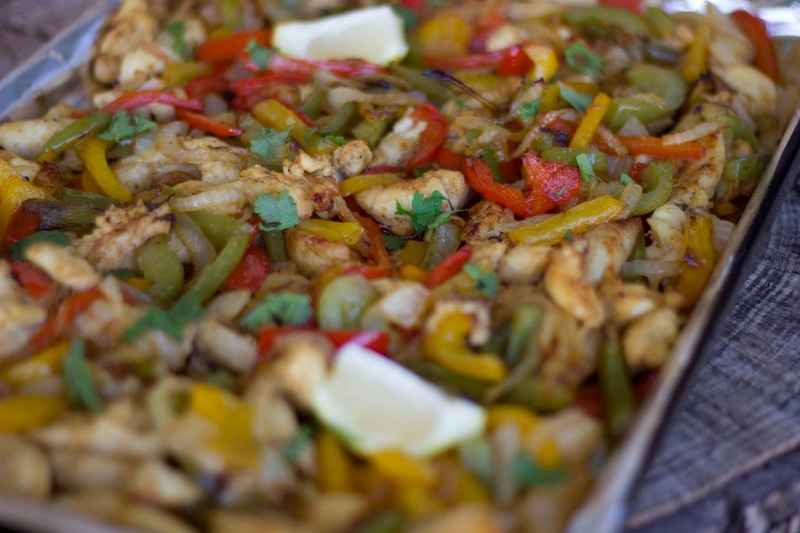 Carefully remove the hot baking sheet from the oven and spread the peppers and onions evenly across the sheet. Place in the oven and bake for 8 minutes. Meanwhile, in the same bowl, combine the remaining oil along with the chicken, chili powder, cumin, garlic powder, salt, black pepper, paprika, coriander and chili flakes. Remove the sheet from the oven, drain off any excess liquid and add the chicken, making sure to separate the pieces of chicken from each other. Return to the oven and bake for 15-20 minutes or until the vegetables are roasted and the fajitas are golden brown. Remove, squeeze the lime juice over top and serve with desired toppings. 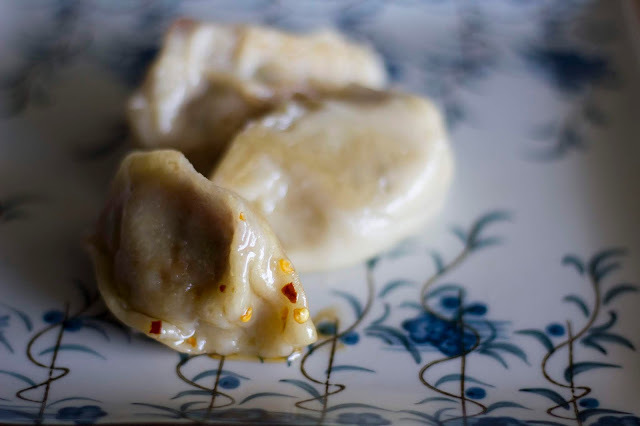 I absolutely love dumplings, but as always, with some dishes, I'm a bit intimidated by the thought of making them myself, and so I steer clear. Well last week while making the new menu plan, I decided that I needed to conquer this fear. Actually it seems that lately I've been conquering quite a few cooking fears, here and there. It's a good thing, and I'm really determined to stop being so scared of trying new dishes and to just jump right in and go for it. What's the worse that could happen? I have to remake it again? I actually found this recipe on Tasty. If you don't know what Tasty is, you have to get on the ball, you can find them all over Facebook, Internet, Youtube and so on. This was super simple to make, and the only real change I will be putting in effect next time I make these, is that I found the dough a bit too thick and I didn't put quite near enough filling because once it's cooked it tends to shrink. I also need to practice the art of pleating and folding a dumpling, which I am terrible at. Other than that, they were delicious, with a very big Capital D.
1. Combine the flour, salt, and warm water and mix until well combined. 2. Roll out dough on a floured surface and knead until smooth. 3. Separate the dough into 4 equal parts. 4. Roll out the piece into a thin log and divide into 6 or 8 pieces depend on the size of dumplings you want. 5. Lightly flour the divided piece of dough and roll out piece to a thin circle roughly 4-inches in diameter. 6. 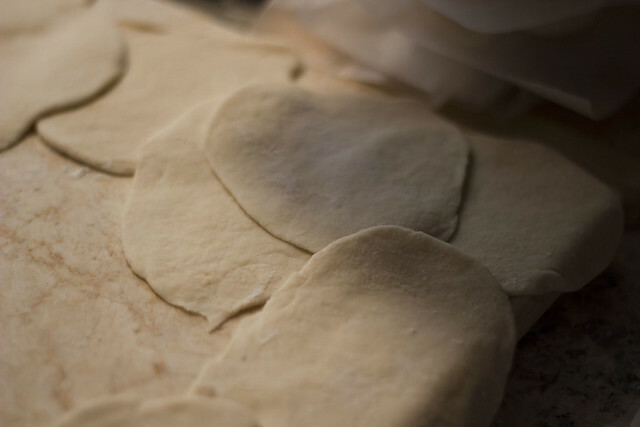 Keep the dumpling wrappers separated with parchment paper, and repeat with remaining dough. 7. 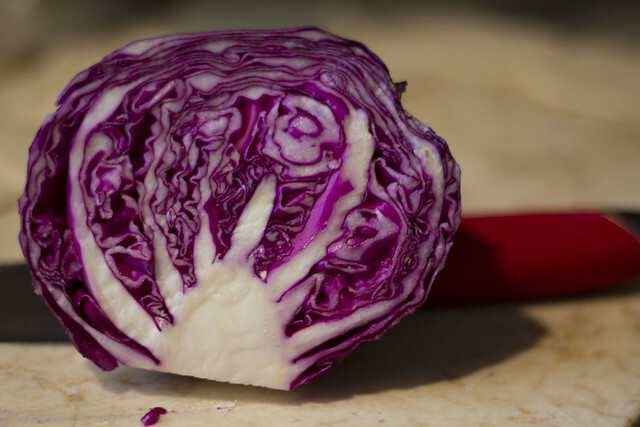 Combine cabbage, green onions, garlic, ginger, soy sauce, and sesame oil and mix until well incorporated. Add pork, salt and pepper. 8. 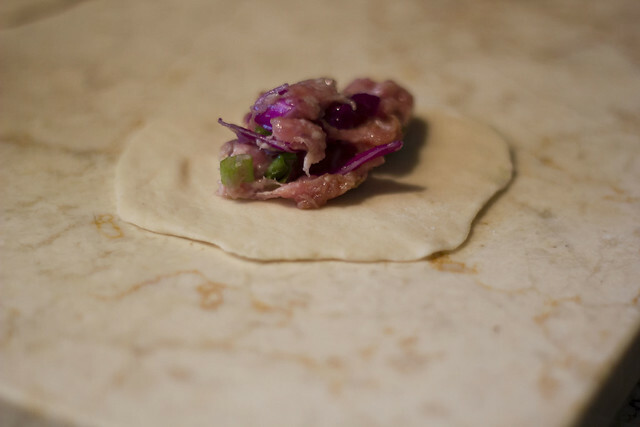 To assembly dumplings, add roughly 1 heaping tablespoon of filling into the center of a dumpling wrapper. 9. With your finger lightly coat 1 half of the outside of the wrapper with water. 10. Seal the dumplings using your preferred method. 11. With pleating, start from one side and pleat the half of the dumpling closest to you, keeping the other half still. 12. Heat oil on medium high in a pan and add a few dumplings, cooking them in batches. 13. Once the bottom of the dumplings start to brown, add in a splash of water and cover with a lid. 14. Steam for roughly 5 minutes, or until dumplings are cooked and water has evaporated.